My friend sent me an article about Bitcoin and Blockchain, spawned by a recent conversation we had on the subject. I haven't read the article yet past the second paragraph, so I can't comment on the content itself, but I am going to point out something that I really liked about how the author included a blurb about his website in his guest post. I most often see a guest writer do one of two things (or sometimes both): 1) Insert a blurb at the end of the article or in the Author Bio. This is great if the visitor finishes reading the entire article and gets to the bottom of the post. 2) Insert an intro blurb about themselves above the article itself. This works, but it's distracting to the flow of the visitor. I came to read the article in the headline, not to read your promo about a website I've never heard of. Plus we have no rapport built yet so I don't have any interest in finding out more about you before you've had a chance to wow me with your article. 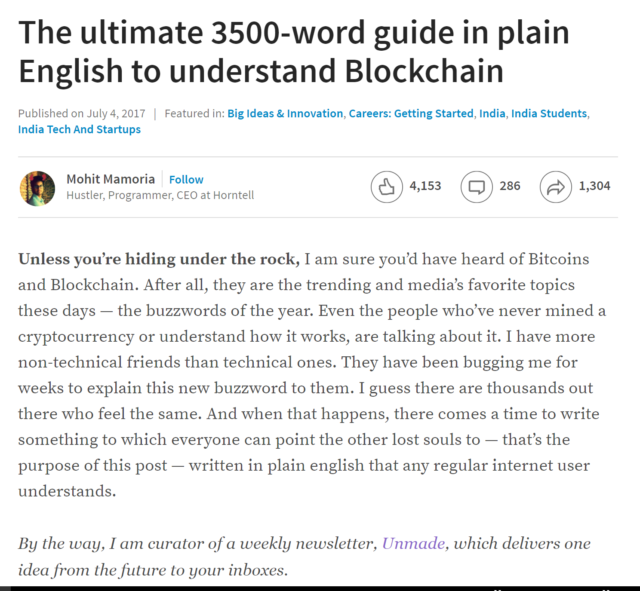 See how he takes you right into the article with an introduction paragraph, and then interrupts you with his promo blurb, “By the way, I am curator of a weekly newsletter, Unmade, which delivers one idea from the future to your inboxes.” It's quick and it's slipped into the article well. I've got a few guest posts coming up and I'm going to try that technique, along with the typical link in my author bio at the end of the article. Now, a simple interruptive sentence like that will only work if it's eye catching like the one in the example above. Consider it as important as a headline on a squeeze page. So I can't expect this technique to work with a boring sentence that doesn't inspire clicks. But I imagine that this technique combined with a unique CTA will hopefully generate more clicks than the two typical methods I described above. It worked on me and I'm a tough sell, and that's why I'm inspired to try it. You should try it too. Some good tips you provide here on this blog Paul, thanks. I like the one about the affiliate disclosure too. Thanks Paul. I’m behind on implementing half of these things but that’s much of the reason why this blog exists – to help me stay organized!